The Ramayana is a masterpiece of Divine Love to Sri Ram. Throughout the verses of the Ramayana, the learned find knowledge, the singers get celestial music, the writers revel in rich poetry and the righteous, a storehouse of Dharma. In this respect the Ramayana is a repository of all sarva-mangala without parallel. Here, my mind is humbly reverting to Sri Hari as Sri Ram, beautifully described by Saint Tulsidas (AD 1532-1623) in his magnum opus Sri Ramcharitmanas. Mother Kaushalya who in her past birth, as wife of Manu had unstinted devotion to Lord Hari. It was unique in that she wished that Lord Hari be born to her as her son. And she demands from the Lord that “chaahaun tumhahi samaan suta” – wish I would have a son like you!”. Well, this must be a tall order to be complied with! So, the Lord in reply pathetically tells her “aapu sarisa khojoun kahan jaayi?” – Where shall I go to find my equal?” How poetically Tulsidas indicates to us that God is unique and therefore, cannot be xerox copied. Take the beautiful song, “Thumaka chalata Ramachandra” where he describes so charmingly of his play with the child Rama. He was stunned at what he saw in his vision: the child form just looked exactly to child Rama and thus he wrote the song, looking at the playful baby. And when Lord Hari indeed appeared now, He came with shankha, chakra, gada, padma in his four arms. That was stunning to her. Immediately Kaushalya went into raptures and started singing hymns to Him. The most funniest thing she felt was that Sri Hari, being birthless, eternal and all-pervading was in her womb all these days! This very incomprehensibility of Lord getting a birth for her sake would even shake the steady minds of munis, she wonders! But she would rather have the Lord as her baby and therefore she prays to Him with both hands folded. “O Lord! Vedas say that you are beyond maya, attributes and knowledge and that the whole universe in all its manifestations resides in your body. Who would ever believe that such as YOU, resided in my womb for nine months? Please O Lord, give up this appearance and become a newborn child, because that is what will give me infinite joy.” And then the Lord, the King of the divine kingdom, smiled, became a baby and started to cry in the lap of mother. Tulsidas in the last line of this lovely piece says that whosoever sings this passage, would be liberated from this world and will never be reborn. A right anti-dote to the disease of samsara (the cycle of birth and death)! Every devotee is precious to the Lord, and He is ever ready to help us succeed. Every spiritual home must have a copy of the Ramayana, and regular reading of this sacred Book will enable us to emulate the lives of exemplary Sri Rama, the immaculate Mother Sita, the dedicated Hanumanji and a host of bright and wonderful characters found in this gem of our scriptures. So, dear devotees, on this very auspicious occasion of Sri Ram Navami, let us all take a resolve to cultivate faith and love for our dear Lord Rama. Did not our Master Sri Ramakrishna assure us that “The One who became Rama and Krishna, has now come into this case (showing his body)”? May all be blessed with spiritual love and enlightenment! In this entire journey of life – our merciful Master is with us, eager to help us when we stumble, forgive us when we make mistake, and encourage us when we falter. Brother Swami Purnananda Ji also joins me in wishing abundance of love and healthy life to every one of you! Just the perfect message for me this Ram Navami. Please accept my pranam, Maharaj ji. Jai Siya Ram! Thanks for your appreciative words! This is such a heartwarming read, specially on the occassion of Ram Navami. While I was reading the note, I was also remembering Lata Mangeshkar’s rendition of ‘thumaka chalata Ramachandra’. Jai Shri Ram, Jai Guru! Pronam to Swami Purnanandaji and your kindself. Yes, Lata‘s musical rendering had the distinctive style of mixing the devotion from the heart. It has even today a unique effect on the listeners. Thank you for an appropriate message today. It gave me immense peace, strength and joy. Many thanks for your lovely post on Sri Rama Navami. Images inserted are soul enthralling. Your way of dwelling on the song ‘Tumaka chalata Ramachandra’ is marvelous. The joy experienced on reading lingers on for a long time. It seems that Most Revered Swami Ranganathanandaji Maharaj was very much fond of this song as reminisced by the late Revered Swami Paramarthanandaji of the RKMath, Hyderabad in a memorial meeting. Once before the start of a post-arati bhajan, Swami Ranganathanandaji requested him to sing this song. Swami Paramarthanandaji replied that as it happened to be a Monday, songs on Shiva would be appropriate to which Sri Maharaj remarked, ”Is there any difference between Rama & Shiva, sing, sing!”. The song was eventually sung with the accompaniment of cymbals by Swami Ranganathanandaji himself! My pranam to Revered Purnanandaji Maharaj. Incidentally, today is Tamil New Year’s day. Please accept my “puththaandu vanakkangal“. Thanks for your hearty comment and words of appericiation! Your quoting the incident of Late Revered Swami Ranganathanandaji is apt. He was bhakti all inside. 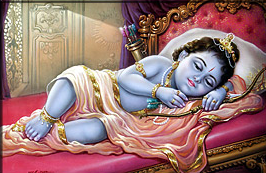 His attraction to Sri Rama can be matched to his devotion to Sri Krishna too. His exposition on Srimad Bhagavatam was so enjoyable to listen. Once, I had the blessed opportunity to accompany him in his lecture tour of Kanpur and surrounding areas. People used to throng to hear him speaking mellifluently in English! In one meeting, the organisers requested him to speak a few words in Hindi. And it was so enchanting to hear him speaking in Hindi on Sri Krishna‘s divinity there for the whole one hour and taking questions from the public and answering in Hindi…!. I was simply spell bound like hundreds of others! Many thanks for your brief but yet delightful recollection of a lecture tour of the great Swami at Kanpur and surrounding areas. By the Grace of Sri Thakur, Ma & Swamiji and your blessings, we are fine here. This is a Comments Section where you are free to place your thoughts, remarks. observations, questions and of course comments! Merely wishing is though good but under-utilisation of the resource and time!